I wonder sometimes if I open my mouth too much about issues for the hungry. I hope you bear with me, because that thought always follows with the one telling me that I must be a voice. Every 3.6 seconds, or the time from one breath to the next, someone in this world dies from hunger. That's 24,000 deaths a day, or over 8 and a half million deaths a year. These deaths are mostly children. 1 in 7 people of this world live in chronic hunger, which is defined as not having a single day of one's life receiving adequate nutrition. That's the same number of people that live in the world's developed nations. In my hands are 3 ounces of rice. 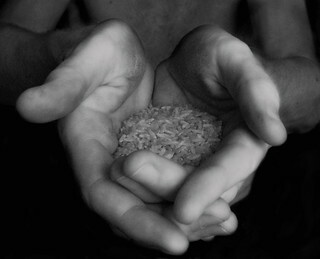 The average person living in chronic hunger receives only this amount of food...daily. The fact is that we have a bountiful God, and it would be funny if it were not so sad that God has given us an earth capable of feeding every human a daily diet of 3,500 calories in grains alone. That's enough to make everyone fat. The sadness is that people still die from hunger. The United Nations knows this. Our governments' leaders know this. We have the distribution know-how to feed everyone. What is lacking is the moral courage of the people to say this is an injustice. As a Christian, I must remember that I pray for our daily bread, not my daily bread. I must fight the temptation to construct a life where the poor are absent, and I must not submit to a theology that makes me comfortable in a world where the poor are invisible. When I do not recognize the faces of the hungry as my brothers and sisters, and when I do not stand up to be the voice for those whose cries go unheard, how sadly ironic it is that I follow the petition to give us this day our daily bread with a request to be forgiven of my sins. "The community which prays, 'Give us this day our daily bread,' and has as its constitutive sacrament the breaking of the bread in Jesus' name is by definition a community in service to the hungry. By virtue of partaking in the sacrament of bread, we become united with the one body of Christ among whose members are multitudes who are hungry. The question becomes not if but how we are going to share the bread on our tables with these hungry brothers and sisters." ~ Dr. Craig L. Nessan, Academic Dean at Wartburg Theological Seminary, "Give Us This Day"